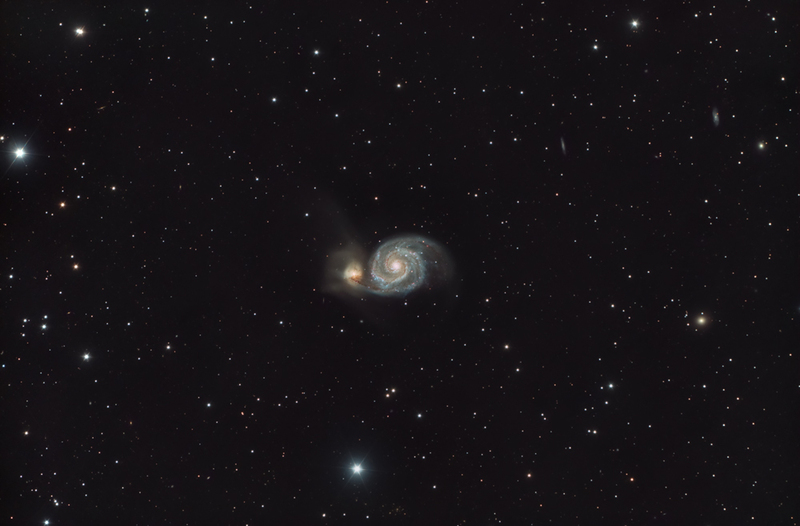 The Whirlpool Galaxy is an interacting grand-design spiral galaxy located at a distance of approximately 23 million light-years in the constellation Canes Venatici. A black hole, surrounded by a ring of dust, is thought to exist at the heart of the spiral. The dust ring stands almost perpendicular to the relatively flat spiral nebula. A secondary ring crosses the primary ring on a different axis, a phenomenon that is contrary to expectations. A pair of ionization cones extend from the axis of the main dust ring. CS3: Curves & Levels, Carboni´s Actions, Smart Sharp on galaxy area, luminance mask saturation, Noiseware Professional. This is not an ideal object for my resolution, but the result is acceptable. The picture was taken one day before the supernova appeared in the bottom arm.